VW has confirmed a price of £22,340 for the R32, the most powerful production Golf yet sold. The six-cylinder six-speed high performance hatchback is available to order now, with first deliveries set for the end of October. 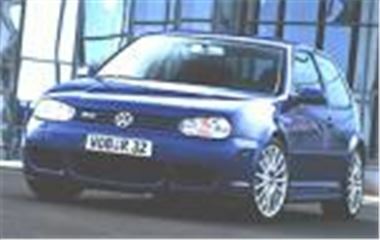 The R32 is the most overtly sporting Golf ever, with a 3.2-litre V6 engine and a highly distinctive appearance. Its narrow-angle 24-valve powerplant produces 240 bhp at 6250 rpm for a 0 to 60 mph time of just 6.3 second, and a top speed of 153 mph. With 4MOTION intelligent four-wheel drive system, lowered suspension, more responsive steering and throttle responses, plus ESP the R32 is more than capable of safely transferring its power to the road. Its most obvious competitor is the new Ford Focus RS. A specially designed exhaust system with twin chrome tailpipes emphasises the R32’s capabilities. From idle to the red line, it produces a distinctive engine note. Visual cues include new front and rear bumpers, side sills, blue brake callipers and imposing 18-inch ‘Aristo’ alloy wheels, while silver ‘R32’ badges take pride of place on the grille and tailgate. Inside, aluminium trim, sports seats with integrated backrests and extensive use of the ‘R’ (or ‘Racing’) logo add further visual distinction. The R32 will only be available in one colour: Deep Blue Pearl metallic. The R32 will be shown at the Paris and Birmingham shows before its arrival in UK showrooms, with 250 examples available this year, and a further 500 set for 2003. Figures not already included are: Combined economy 24.6mpg; CO2 276g/km.